Citation: Yu M, Luan B, Tian S, et al. Comparing methods of tranexamic acid administration and blood reinfusion in reducing blood loss during total knee arthroplasty. Hematol Blood Disord. 2017;1(1):6-10. Background: Perioperative blood loss is associated with total knee arthroplasty (TKA). The tranexamic acid (TXA) is a plasminogen activator inhibitor widely used to prevent bleeding. The Stryker CBC II ConstaVac Blood Conservation System (CBC II, Stryker) can avoid homologous blood. The purpose of this study is to compare the efficacy of intravenous and topical regimen of TXA in primary TKA, and compare the efficacy of TXA and CBC II in primary TKA. Methods: The study included 202 patients accepted primary TKA from May 2010 to May 2015. The patients were divided into four groups: 53 patients were administered intravenously with 1000 mg TXA. 54 patients in an age and gender-matched group were topical administration with 1000mg of TXA in 100 cc of saline. 49 patients in an age and gender-matched control group undergo the treatment of blood reinfusion by CBC II. Control group included 46 patients did not take TXA and CBC II. Results: Post-operative 24 h total drainage volume were lowest, and the post-operative 24 h Hgb was highest in the group administered intravenously of TXA (p<0.05). The transfusion rate, amount of red blood cell suspension and frozen plasma were lowest in the administered intravenously of TXA group (p<0.05). Here was no thromboembolic event in four groups. Conclusions: Perioperative blood loss could be reduced by intravenous and topical regimen of TXA and CBC II after TKA. In addition, the application of TXA and CBC II is not associated with increased risk of thromboembolic complications. Perioperative blood loss is one of the most common complications during the TKA surgery with estimated blood loss between 1450 and 1790 ml [1-4]. The incidence of transfusion after TKA has been reported ranging from 11% to 67% [5,6]. Stokes et al. found the disadvantages of blood transfusion after total knee and hip arthroplasty include longer length of hospital stay, infection, increased morbidity and mortality, especially in increased costs . Therefore, it is a great challenge for orthopedic surgeons to reduce blood loss in total knee arthroplasty. TXA is a plasminogen activator inhibitor which can reduce perioperative blood loss and incidence of transfusion in knee arthoplasty [8-13]. The CBC II blood conservation system (CBC II) from Stryker is a safe and simple disposable system that in favor of an economic solution for blood reinfusion. The safety and usefulness of using the Stryker CBC II after total knee arthroplasty was confirmed by some studies . However, it is the controversial that comparison among the TXA and the CBC II is more effective reducing hemoglobin drop after TKA. The study was completed for comprehensive comparison of intravenous and topical application of TXA and using the CBC II in patients undergo primary total knee arthroplasty. Materials and methods: The inclusion criteria of four groups are as follows: all patients with osteoarthritis of knee, and routine blood, blood glucose, blood lipids, blood pressure is normal, and with normal blood clotting mechanism which was conform by prothrombin time, activation of partial thrombin time, thrombin time, fibrinogen and platelet function. The average pre-operative 24 h Hgb (and standard deviation) was 125.55 ± 10.15 g/L in knees administered intravenously, 137.82 ± 11.25 g/L in knees with topical administration, 127.25 ± 10.61 g/L in CBC II knees, 142 ± 12.27 g/L in control group. More than 5 years history but not more than 10 years, preoperative three weeks to stop taking non-steroidal anti-inflammatory drugs (NSAIDs), and no history of hormone use. The ones with a history of VTE were excluded. All surgical patients are general anesthesia, the operations were performed by the same surgeon team, a thigh tourniquet pressure of 70 kPa was used after exsanguinations band and, and hours to relax for ten minutes. The prosthesis was posterior stabilized knee joint prosthesis of JNJ (Johnson & Johnson). This clinical, randomized study was performed on 202 patients who were underwent unilateral TKA in our hospital, from May 2010 to May 2015 (Table 1). The patients suffering the primary total knee arthroplasty were randomly assigned to four study groups. 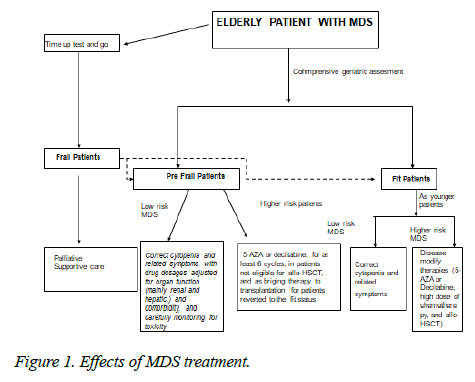 The average age of patients in the group undergo administered intravenously was 67.6 (48-82) (group 1), 62.3 (52-72) in group undergo topical administration (group 2), and 65.4 (54-79) in group undergo blood reinfusion(group 3), and 66.8 (59-76) in control group(group 4). In group 1, patients included 8 men and 45 women. 500 mg of TXA in 250 cc of saline was administered intravenously 30 minutes before tourniquet was used, and 500 mg of TXA in 250 cc of saline was administered intravenously 30 minutes after loosening the tourniquet immediately. In group 2, patients included 7 men and 47 women, the knee joint cavity irrigated with 1000 mg of TXA in 100 cc of saline before closing the wound. In group 3, patients included 7 men and 42 women, patients did not undergo the treatment with TXA. CBC II Consta Vac blood conservation system (CBC II, Stryker) was applied to each patient. In group 4, control group, patients included 5 men and 41 women did not take TXA and CBC II. For the prevention of DVT, the Nadroparin calcium is administered as a subcutaneous injection. Low molecular weight nadroparin calcium is administrated subcutaneous injection to every patient before surgery for a week with 4000 UI each day, stopped 24 hrs before surgery and resume administration 24 hrs after surgery for consecutive 30 days. All statistical analyses were carried out with R version 3.1.1 so ftware (R Foundation for Statistical Computing ,Vienna, Austri a). We performed an analysis of the ANOVA Test, a value of P<0.05 was set to show statistical significance. The average post-operative 24 h total drainage volume (and standard deviation) was 328.87 ± 54.12 ml in knees administered intravenously, 415.46 ± 41.77 ml in knees with topical administration, 650.20 ± 141.15 ml in CBC II knees, and 643.91 ± 138.21 ml in control group (Figure 1). Figure 1: The average post-operative 24 h total drainage volume (and standard deviation) in patients. ***P<0.001. AI: administered intravenously; TA: topical administration; CBC II: CBC II Consta Vac blood conservation system. The average post-operative 24 h Hgb (and standard deviation) was 96.11 ± 8.45 g/L in knees administered intravenously, 88.28 ± 10.15 g/L in knees with topical administration, 90.61 ± 10.87 g/L in CBC II knees, 82.41 ± 8.17 g/L in control group (Figure 2). Figure 2: The average post-operative 24 h Hgb (and standard deviation) in patients. ***P<0.001. AI: administered intravenously; TA: topical administration; CBC II: CBC II Consta Vac blood conservation system. The number of patients transfused was 12 in group of administered intravenously, was 27 in group of topical administration, was 24 in group of CBC II, and was 34 in control group. The transfusion rate of patients transfused was 0.23 in group of administered intravenously, was 0.5 in group of topical administration, was 0.49 in group of CBC II, and was 0.76 in control group. 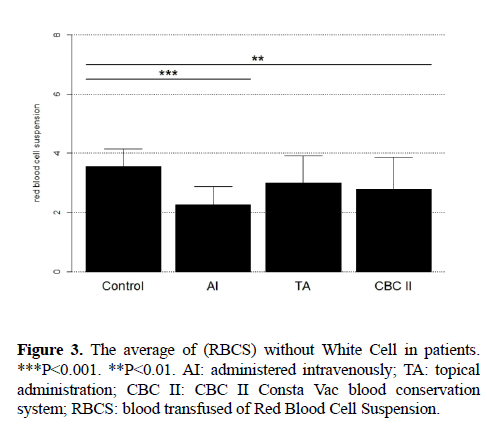 The average of blood transfused of Red Blood Cell Suspension (RBCS) without White Cell was 2.08 IU in group of administered intravenously, was 3 IU in group of topical administration, was 2.79 IU in group of CBC II, and was 3.75 IU in control group (Figure 3). Figure 3: The average of (RBCS) without White Cell in patients. ***P<0.001. **P<0.01. AI: administered intravenously; TA: topical administration; CBC II: CBC II Consta Vac blood conservation system; RBCS: blood transfused of Red Blood Cell Suspension. The average of frozen plasma transfused was 3.83 IU in group of administered intravenously, was 4.44 IU in group of topical administration, was 4.86 IU in group of CBC II, and was 6.62 IU in control group (Figure 4). Figure 4: The average of frozen plasma transfused in patients. *P<0.05. AI: administered intravenously; TA: topical administration; CBC II: CBC II Consta Vac blood conservation system; RBCS: blood transfused of Red Blood Cell Suspension. In 1966, studies showed the effect of a new potent antifibrinolytic agent, tranexamic acid . In 1968, Vermylen et al investigated the effect of tranexamic acid in essential menorrhagia by a double blind study . Since then, the use of tranexamic acid as hemostatic in haemophilia , oral surgery , upper gastrointestinal haemorrhage , prostatic adenomectomy , hereditary angioneurotic edema , and cataract surgery  had been studied. In 1972, Hiippala introduced the concept of tranexamic acid reducing perioperative blood loss associated with total knee arthroplasty . In 2000, Ekbäck G et al investigated the effect of reduces blood loss of tranexamic acid in total hip replacement surgery . Since then, tranexamic acid as hemostatic in arthroplasty to reduces perioperative blood loss has been extensively studied [25-33]. To transfer the liquid the lever needs to be depressed and the blood bag should be hung and spiked. This is a vital part of the blood conservation program. Only one disposable needs to be used per patient and it easily converts from reinfusion device to drainage reservoir. Its main components include a variable vacuum setting, an internal prefilter, a fat retention valve and a vacuum indicator. The volumetric graduations are accurate. This study demonstrates a distinct correlation between the administration of TXA and reduces perioperative blood loss in Chinese patients. In our study, intravenous administration of TXA reduced drainage amount by 49% and irrigation of the knee joint with TXA decreased it by 35%, compared to the control group. Intravenous injection of TXA was more effective than the knee joint cavity irrigated to reduce the total drainage volume. It is no statistical differences to reduce the total drainage volume between CBC II group and control group. This study demonstrates that intravenous injection of TXA is significantly reduces the post-operative Hb drop. However, there was no difference in the joint cavity irrigated group and CBC II group of the post-operative Hb drop. There is some concern that a risk of thrombosis by TXA carries theoretically. However, to date the some studies has not shown a significant risk in the total joint arthroplasty population [34-36]. In our study, we did not found a greater risk of thromboembolic disorders with the use of TXA and CBC II. It may due to use of Low molecular weight Heparins Calcium (Nadroparin calcium). Nadroparin is an anticoagulant belonging to a class of drugs called low molecular weight heparins, which is used in orthopedic surgery to prevent deep vein thrombosis and pulmonary embolism, and as treatment for deep vein thrombosis . When administrated intravenously, TXA diffuses rapidly into the synovial fluid and synovial membranes, until the concentration of the TXA in synovial fluid reaches to the concentration of serum [38,39]. Therefore, TXA preoperative must be applied within 30 minutes before using a tourniquet. The blood from the intravenous group and the irrigated group contains TXA and metabolites, it is not clear whether can induce thrombosis. The assumption we made here is as follows, the frequency of injecting blood will be reduced to the least amount, provided that the patient is treated by TXA together with CBC II re-injection. However, after intravenous or local injection of TXA, TXA breaks down during the progress of CBC II blood collection, which will increase the adverse reaction for patients. Blood clotting or other unpredictable events may happen, and it is still understudied to make any conclusions. In conclusion, TXA may play an important role in improving the general conditions of patients undergoing TKA by decreasing blood loss and maintaining a hemodynamically stable state. 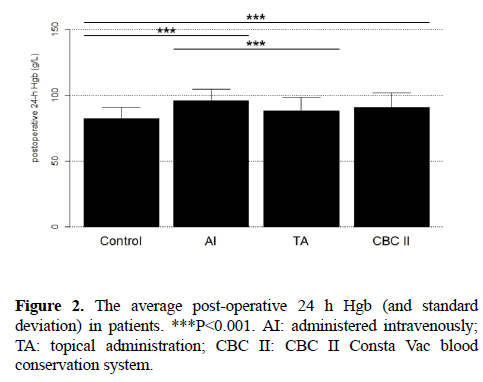 Intravenous injection of TXA prevents the postoperative Hb drop much more effectively than the knee joint cavity irrigated of TXA and blood reinfusion by CBC II. Hiippala ST, Strid LJ, Wennerstrand MI, et al. Tranexamic acid radically decreases blood loss and transfusions associated with total knee arthroplasty. Anesth Analg. 1997;84:839-44. Remérand F, Cotten M, N'Guessan YF, et al. Tranexamic acid decreases risk of haematomas but not pain after hip arthroplasty. Orthop Traumatol Surg Res. 2013;99:667-73. Biarnés Suñé A, Ciércoles Jiménez E, et al. Risk factors for transfusion in primary knee arthroplasty. Rev Esp AnestesiolReanim. 2006;53:18-24. Hart A, Khalil JA, Carli A, et al. Blood transfusion in primary total hip and knee arthroplasty. Incidence, risk factors, and thirty-day complication rates. J Bone Joint Surg Am. 2014;96:1945-51. Pope D, El-Othmani MM, Manning BT, et al. Impact of Age, Gender and Anesthesia Modality on Post-Operative Pain in Total Knee Arthroplasty Patients. Iowa Orthop J. 2015;35:92-8. Noticewala MS, Nyce JD, Wang W, et al. Predicting need for allogeneic transfusion after total knee arthroplasty. J Arthroplasty. 2012;27:961-7. Hynes M, P. Calder, G. Scott. The use of tranexamic acid to reduce blood loss during total knee arthroplasty. Knee. 2003;10:375-7. Delanois RE, Mont MA. Does tranexamic acid reduce blood loss in total knee arthroplasty. J Bone Joint Surg Am. 2013;95:179. Digas G, Koutsogiannis I, Meletiadis G, et al. Intra-articular injection of tranexamic acid reduce blood loss in cemented total knee arthroplasty. Eur J Orthop Surg Traumatol. 2015;4:35-7. Mutsuzaki H, K. Ikeda. Intra-articular injection of tranexamic acid via a drain plus drain-clamping to reduce blood loss in cementless total knee arthroplasty. J Orthop Surg Res. 2012;7:32. Chareancholvanich K, Siriwattanasakul P, Narkbunnam R, et al. Temporary clamping of drain combined with tranexamic acid reduce blood loss after total knee arthroplasty: a prospective randomized controlled trial. BMC Musculoskelet Disord. 2012;13:124. MacGillivray RG, Tarabichi SB, Hawari MF, et al. Tranexamic acid to reduce blood loss after bilateral total knee arthroplasty: a prospective, randomized double blind study. J Arthroplasty. 2011; 26:24-8. Steven T, Woolson A, William W, et al. Autologous blood transfusion after total knee arthroplasty: A randomized, prospective study comparing predonated and postoperative salvage blood. J Arthroplasty. 18:243-9. Kobayashi T, Sugiura J.J. The effect of a new potent antifibrinolytic agent, tranexamic acid. Jpn Obstet Gynecol Soc. 1966;13:158-67. Vermylen J, Verhaegen-Declercq ML, Fierens F, et al. A double blind study of the effect of tranexamic acid in essential menorrhagia. Bull Soc R Belge Gynecol Obstet. 1968;38:385-90. Ingram GI, Inglish PJ, Bennett AE. Tranexamic acid for prophylaxis in haemophilia. J Clin Pathol. 1972;25:629. Bedil M. Use of tranexamic acid as hemostatic in oral surgery. Trib Odontol (B Aires). 1971;55:175-6. Cormack F, Chakrabarti RR, Jouhar AJ, et al. Tranexamic acid in upper gastrointestinal haemorrhage. Lancet. 1973;1:1207-8. Raymond G, Fournier P, Cazenave G. Action of tranexamic acid on pre and post-operative bleeding after prostatic adenomectomy (double blind study). J Urol Nephrol (Paris). 1973;79:958-962. Lundh B. Tranexamic acid in hereditary angioneurotic edema--a progress report. N Engl J Med. 1973;288:53. Spaeth GL. The effect of bromelains on the inflammatory response caused by cataract extraction: a double-blind study. Eye Ear Nose Throat Mon. 1968;47:634-9. Hiippala S, Strid L, Wennerstrand M, et al. Tranexamic acid (Cyklokapron) reduces perioperative blood loss associated with total knee arthroplasty. Br J Anaesth. 1995;74:534-7. Ekbäck G, Axelsson K, Ryttberg L, et al. Tranexamic acid reduces blood loss in total hip replacement surgery. Anesth Analg. 2000;91:1124-1130. Hourlier H, Reina N, Fennema P. Single dose intravenous tranexamic acid as effective as continuous infusion in primary total knee arthroplasty: a randomised clinical trial. Arch Orthop Trauma Surg. 2015;135:465-471. Carvalho LH Jr, Frois Temponi E, Machado Soares LF, et al. Bleeding reduction after topical application of tranexamic acid together with Betadine solution in total knee arthroplasty. A randomised controlled study. Orthop Traumatol Surg Res. 2015;101(1):83-7. Moskal JT, Harris RN, Capps SG. Transfusion cost savings with tranexamic acid in primary total knee arthroplasty from 2009 to 2012. J Arthroplasty. 2015;30:365-8. Hamlin BR, DiGioia AM, Plakseychuk AY, et al. Topical versus intravenous tranexamic acid in total knee arthroplasty. J Arthroplasty. 2015;30:384-6. Tahmasebi MN, Bashti K, Ghorbani G, et al. Intraarticular Administration of Tranexamic Acid Following Total Knee Arthroplasty: A Case-control Study. Arch Bone Jt Surg. 2014;2:141-5. Sabatini L, Atzori F, Revello S, et al. Intravenous use of tranexamic acid reduces postoperative blood loss in total knee arthroplasty. Arch Orthop Trauma Surg. 2014;134:1609-1614. Bidolegui F, Arce G, Lugones A, et al. Tranexamic Acid Reduces Blood Loss and Transfusion in Patients Undergoing Total Knee Arthroplasty without Tourniquet: A Prospective Randomized Controlled Trial. Open Orthop J. 2014;8:250-4. Samujh C, Falls TD, Wessel R, et al. Decreased blood transfusion following revision total knee arthroplasty using tranexamic acid. J Arthroplasty. 2014;29:182-5. Gillette BP, Maradit Kremers H, Duncan CM, et al. Low risk of thromboembolic com-plications with tranexamic acid after primary total hip and knee arthroplasty. Clin Orthop Relat Res. 2013;471:880. Panteli M, Papakostidis C, Dahabreh Z, et al. Topical tranexamic acid in total knee re-placement: a systematic review and meta-analysis. Knee. 2013;20:300. Tan J, Chen H, Liu Q, et al. A meta-analysis of the effectiveness and safety of using tranexamic acid in primary unilateral total knee arthroplasty. J Surg Res. 2013;3:184. Heckmann M, Thermann H, Heckmann F.b Rivaroxaban versus high dose nadroparin for thromboprophylaxis after hip or knee arthroplasty. Hamostaseologie. 2015;35:358-363. Maniar RN, Kumar G, Singhi T, et al. Most effective regimen of tranexamic acid in knee arthroplasty: a prospective randomized controlled study in 240 patients. Clin Orthop Relat Res. 2012;470:2605-2612. Sarzaeem MM, Razi M, Kazemian G, et al. Comparing efficacy of three methods of tranexamic acid administration in reducing hemoglobin drop following total knee arthroplasty. J Arthroplasty. 2014;29:1521-4.